When You Start Exploring Teeth Whitening Products, The Search Can Be Overwhelming. They come in all sizes, shapes, type and flavors, literally. Lets divide them up into three categories. First, there is the in-the-dental-office category, second, there is the retail product category and third, the do-it-yourself category. The in-office category starts with dental hygiene efforts focused on tooth stain and deposit removal. It is the basic form of tooth whitening. The best place to start the evaluation process for additional whitening opportunities is after the surface stains are removed professionally. This is where it gets tricky. It is now you may decide to “go it on your own” or continue to seek a professional opinion. If you seek a professional opinion, you will likely discover tried-and-true methods of teeth whitening that work predictably. If not, you have to be ready to experience some potential downside risks. The variety of colors that your dental hygienist sees everyday is amazing. She may see brown stain, black stain, orange, green, metallic, yellow, brown and in some cultures even a red-black. The stains occur for a variety of reasons, all of which may prompt you to look at different teeth whitening products or procedures. 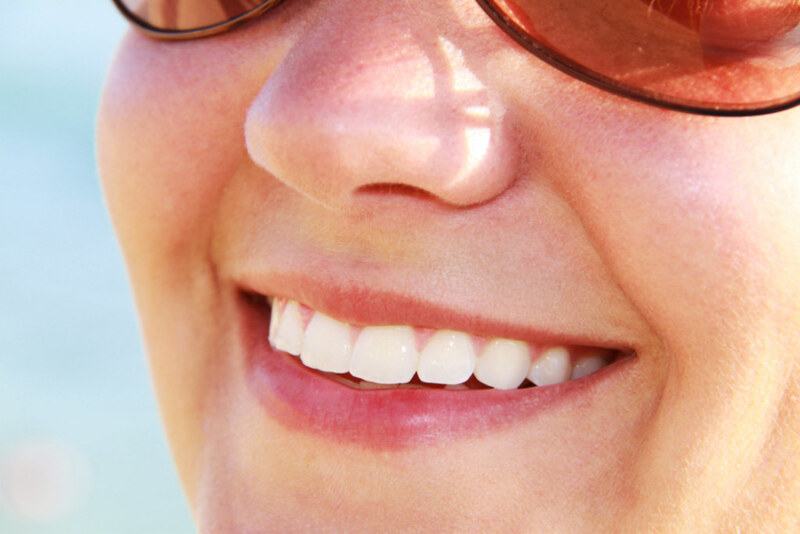 To understand the different approaches to teeth whitening it’s important to under stand where the stains are located. These are stains that occur on the outside of the tooth. They are often stains that adhere to a very thin protein layer that exists on all teeth. The good thing about extrinsic stains is that they can be removed with most good dental hygiene procedures. Brown extrinsic stains can be due to the tannins in tea or coffee. If these are building up they are probably due to inadequate brushing or the use of the toothpaste that does not have the right abrasive characteristics for you. Brown to black stains can also be due to smoking as tobacco and marijuana will produce hot tars in smoke that will condense or adhere to teeth. These tars will be difficult to remove if allowed to thicken as a result of incomplete removal during toothbrushing. If you look in the bathroom mirror and you are a smoker, you may see these as black “smiles” on teeth at the gumline on lower teeth and black “frowns” at the gum line on upper teeth. Another interesting source of black stain on teeth is something called chromogenic bacteria. Oddly enough, it’s often found in women who have very good oral hygiene with little residual plaque left at the gum line after brushing and flossing. It’s one of those “it’s not fair” stains that are not deserved, but happen nevertheless. And it’s interesting also that those same women will frequently have a very low incidence of cavities. Some studies believe it might be related to milk or cheese consumption and a compound they contain called lactoferrin. It is also interesting to note that daily cheese consumers seem to have a lower incidence of cavities too, regardless of the black stain prevalence. Orange stains have occurred as a result of industrial chemical exposure as well as chromogenic bacteria. Green stains can have multiple causes. Some are the result of chromogenic bacteria. Others as a result of a thick layer of plaque left behind after brushing or breakdown products of bleeding gums. Some mouthwashes contain various metal compounds that can also cause a green staining of teeth. Metallic stains can also be caused by exposure to metal dust or dissolved metals in mouthwash. Yellow stains can be due to mouthwashes that contain phenol compounds such as like methyl salicylate, ethanol, thymol, menthol and eucalyptol. One comes to mind that was named after the discoverer of phenol-Dr. Joseph Lister. There are transitional stains that can move from surface stains (extrinsic) to internal stains (intrinsic) over time with repeated exposure. Usually this occurs with insufficient or ineffective brushing and home care efforts. These may be due to frequent exposure to highly pigmented foods like red wine or soy sauce. Coffee, tea and black licorice are also great stain producers with the potential to cause transitional staining. Tomato based sauces will also stain teeth. Tumeric, a spice that is very healthy for your body can also give your teeth an amazing yellow cast. It is found in curry and many Indian recipes. I love tumeric, but I don’t worry about it because I don’t eat it every day. The same goes for healthy high-antioxidant berries. Eat them with other non-staining foods and follow with a glass of water to clear the bits from your teeth. I am sure you are not exclusively eating these stain makers without other fruits and vegetable in your diet so don’t go crazy trying to avoid them. Tobacco and similar products that are smoked regularly can deeply stain teeth. The smoker’s initial surface stains can seep into minute fractures or “craze” lines in teeth permanently staining them brown to black. These stains have shifted from a polish to remove surface stain to an intrinsic stain. As long as you are consuming stain producing foods with other non-staining ones, I think you are pretty safe, with effective home care. All of the stains mentioned above are routinely addressed by your dental hygienist using the instruments available. They are the scalers, ultrasonic scalers, baking-soda-water-jet sprays, and polishing compounds. Some offices will have additional useful stain and bacteria removal devices. Intrinsic stains are a different type of stain. They have been incorporated into the tooth itself through percolation or seepage from the surface due to repeated exposure. They have moved from surface to transitional to internal and will not polish off as they are not exclusively on the surface. Intrinsic stains also include those incorporated into the body of the tooth itself during formation. Fluoride compounds found in drinking water can cause an unattractive golden brown intrinsic stain. It has been called Texas or Colorado brown stain and is due to fluoride actually incorporated into the tooth during it’s formation under the gums, before it erupts. Fluoride stain is an intrinsic stain and cannot be removed without removing some of the tooth enamel itself or covering it with a bonded filling or bonded porcelain veneer or crown to mask it. Long term tetracycline antibiotic use for acne or other reasons can cause a deep blue brown stain to occur. It can affect the the second layer of the tooth that resides under the enamel, called the dentin, as well as all of the root portion of the tooth during development. Tetracycline staining can be some of the most disfiguring staining to occur. I have removed it using custom tray teeth whiteners but, it responds slowly and take months of repeated use. A variation on this method is the use of the gum protection mentioned above plus a high intensity light that activates and accelerates the bleaching solution. Heat, generated by the light also speeds up the bleaching process which can result in a brighter initial result but with a slight increase in the risk of tooth sensitivity. Lips and facial tissue are also protected from the intense near ultra violet light by barriers removed after the session. A third variation uses a laser to accelerate the bleaching action after protecting your gum tissue. It has a lower risk of lip and facial heat generation but still may cause some minor tooth sensitivity. Regardless of the particular mode your dentist provides, it is nice to have a place to contact if you have questions or problems. The primary advantage of in-office doctor-supervised smile brightening is the immediate change of up to 10 shades in one session. The reality is that sometimes even this method may require an additional session to achieve the level of brightness you desire if staining is severe. Another type of doctor supervised smile brightening uses a teeth whitening product that holds a whitening solution against your teeth using a custom-formed tray. To make the custom-formed tray, your dentist will make impressions or molds of your teeth recording their shape and position. From the impressions a set of clear plastic forms are made that carefully cover your teeth, stopping at the gumline. The trays are designed to hold the teeth whitening product against your teeth while protecting the gum tissue. The forms are worn with a bleaching solution applied to the inner surface. When inserted in your mouth, the tooth whitening product is held against the enamel covered part of your teeth with minimal leakage. On the day you receive the bleaching trays, you will be instructed where to place the solution in the trays and how much to use. The trays will also be evaluated for fit. If the trays are too loose, saliva will dilute the solution reducing its effectiveness increasing gum irritation. Your doctor will likely schedule an appointment or two to see how you’re doing and check on progress. The tray method is often used as a follow-up to the, in-office, doctor-supervised, single-appointment teeth whitening procedures to “fine tune” the level of brightening you desire. If you desire more whitening, you can gradually accomplish it. I like the custom tray method as it allows you make a whitening change over time, meaning days to weeks and minimizes the sensitivity potential. If you have particularly stubborn stains, such as those associated with tetracycline use, much more time will be required to accomplish your goal. It may take months of solution application to reach a satisfactory result. If you have a difference in the color of natural teeth, you can apply the solution to only one tooth at a time if necessary. Then, when a darker tooth reaches the color of the surrounding teeth, all of them can then be whitened together. This method, in my opinion, is the best teeth whitening method. It allows you to control the rate of whitening. If you have some sensitivity, you can pause the use of the teeth whitening product, and resume it a few days later. Consult with your dentist to arrive at the best tooth whitening product selection and a plan for results, your budget and time frame. Retail teeth whitening product are found in drug stores, pharmacies and a gazillion online locations. The various rinses, non-customized preformed trays, toothpastes and swab applicators have the benefit of being less expensive ways to accomplish teeth whitening compared to in the dental office methods. Each particular type has an advantage that the manufacturer will proudly extol. Some of these varieties are available in dental offices for retail purchase too. Ask your dentist, you may get some specific input regarding the effectiveness of each type. The retail products typically are more “technique sensitive” and may take longer to obtain the desired result. And in some instances they can have have rather undesirable results. Ask around. They are, of course, all susceptible to the initial quality of the product and how complete the manufacture’s instructions are. How well you follow the instructions, during their use, is also very important. As a precaution, I would stick to products made in the UK or the US for now. A variety of rinses are available for teeth whitening with many of them using hydrogen peroxide as the active ingredient. Hydrogen peroxide reacts chemically with parts of stain producing molecules on the surface or beneath the surface of teeth. When it reacts, it converts the visible stain causing molecule into one that is invisible and the stain disappears. You can feel hydrogen peroxide reacting with your lips, cheeks and your tongue. It will damage the surface cells lining the more sensitive areas of your mouth to some extent, so I would not recommend using it in a mouthwash on a daily basis. Hydrogen peroxide falls into the category of compounds used for years in mouthwashes that have been generally recognized as safe-GRAS. Alcohol free mouthwashes are seeing an increase in popularity to due to the desire to avoid alcohol toxicity issues. I expect that those concerned about minimizing exposure to potentially harmful chemicals will also limit their use of peroxide containing mouthwashes. Manufacturers also understand the risks of potential tissue damage of hydrogen peroxide in products. So, in any daily use products, they will reduce the strength to the point that it will create little harm. As the strength of the active ingredient goes down, so does its effectiveness as a teeth whitener. My conclusion: rinses are almost useless as effective teeth whiteners, as is the fictitious- “Super Duper Whitening Spray For A Dazzling Smile,” seen above. Are Strips The Best Teeth Whitening Products In The Retail Category? Teeth whitening strips have been around for a number of years. Initially, they were plagued with a number is issues that made them a very unreliable method of teeth whitening. The strips are certainly technique sensitive, so how you use them is paramount to good success. If they were applied to only part of the tooth, to keep them from irritating the gums, the teeth were left with a banding in coloration. Teeth were visibly whiter where the strip covered the tooth and yellower where it didn’t. Racing stripes for teeth did not go over well, but it was the best available option outside the dental office. If you varied the position of the strips for each application eventually you got a reasonably acceptable result. Fortunately, improvements have been made and the results are now much better than they used to be. They use a solution of hydrogen peroxide at a variety of strengths. A 10% hydrogen peroxide strength is a popular one. The directions are to apply the strips to the teeth, adapting them carefully, so that only the tooth is covered and not the gum tissue. Taking care here is important to avoid the banding mentioned earlier and the gum tissue irritation. The improvements have occurred in the solution strengths, and the adhesives used for stability. The newer strips stay on the teeth better. Instead of having to sit quietly for 30 minutes, minimizing speaking and lip movement, the newer adhesives allow for activity including drinking water during the application period. They minimize the amount of whitening solution that you can swallow which is a major plus for the place-wear-and-remove strips. Another variety, available from a major U.S. drugstore chain, features strips that are self-dissolving. The complaints are the strips taste gross and don’t stay in place. It’s just something more you don’t need to swallow. Once you whiten your teeth to the level that you want, will they stay that way? Short answer, no. We are continuously exposed to a variety of food colors and staining materials. As a result, we are likely to have to continue the teeth whitening process periodically to maintain the level of brightness we desire. Whitening pens are not new. But, with each iteration of an existing product or introduction of a new product, we are bombarded with media extolling the virtues of the latest arrival. I have tried several of the available pen products with relatively unimpressive result. I cannot apply the pens to my teeth rubbing on them for 5 minutes without thinking there has to be a better way. Maybe it’s just me, but the pens I have tried are not working. There is a new swab system getting radio and TV ad time recently that I will try, just to be fair. So I will order it today. The new system promises a super-duper detergent to remove staining material from teeth, followed by a teeth whitening solution for two minutes. The swabs are designed to lift stains from teeth and existing dental work, which is unique since no other product I am aware of makes this claim. The whitening swabs that follow the stain lifting, will only whiten natural teeth. It’s worth a try. Just like airplane seats one size does not fit everybody. The preformed trays are designed to substitute for the custom made ones available in the dental office. The advantage is they are much less expensive. The downside is the lack of adaptability to your teeth. The solution is squirted into the tray and placed into your mouth while you bite into the form. Some brands have individual trays and others one that is supposed to accommodate both upper and lower teeth the same time. Holding the ill fitting tray(s) in place stimulates saliva production which is actively diluting the whitening solution. This means that you are swallowing moderate to large quantities of the whitening solution while waiting for the 30 minute timer to go off. Another variation of the home teeth whitening kit is one with thermo-plastic trays. These are semi-custom trays that you adapt to your teeth after softening them in boiling water. It may take more than one attempt to get them to fit well. The biggest downside is again the incomplete adaptation to your teeth. This allows the whitening solution to easily leak from the trays onto sensitive gums. As the trays are to kept in place for anywhere from 30 minutes to 4 hours, with this brand, the solution can be swallowed in moderate to large quantities too. In conversations with my patients, I recognize many of them would like to avoid unnecessary chemicals as much as possible. In making those lifestyle decisions they use natural products as often as possible. When questioned about how can I have whiter teeth? I have to go back to the basics of removing surface stains that have occurred and preventing the buildup of as many new ones as possible. Can I Use Hydrogen Peroxide Safely? Some of my patients are very comfortable with using hydrogen peroxide as it exists in the body naturally, others are not. If hydrogen peroxide is used, I would make the effort to remove the stain and not use it again until the stain was again intolerable. The daily exposure to a low level of peroxide may be ineffective for stain removal while still serving to irritate oral tissues such as the tongue, cheeks, gums and palate. I would not recommend it’s daily use. I think in terms of using an effective strength of hydrogen peroxide, and limiting the exposure to oral tissues beside the teeth. If using the strips for teeth whitening, the hydrogen peroxide is limited primarily to the areas covered by the strips. If using dentist fabricated custom formed trays, the exposure to carbamide peroxide, which releases hydrogen peroxide, is limited to only the teeth, with correct application of the gel into the trays. If you have decided that you will forego the use of hydrogen peroxide, your options are limited to the use of the physical removal of stains by polishing. A protein layer that forms on your teeth daily is called the pellicle. It is defined as-a thin skin, cuticle, membrane, or film. This layer which forms from your saliva, is what most stains adhere to. If this layer is polished off daily, there is a reduced opportunity for significant stains to develop. Our goal then, for stain prevention and removal, is the daily removal of the pellicle and any attached stains. So lets look at the most effective ways to approach stain prevention and removal using natural products. The common home remedy abrasives are table salt, baking soda, bentonite clay, diatomaceous earth, activated charcoal, and calcium carbonate. These abrasives are used to remove the stains adhering to the pellicle. When compared to all of the different polishing compounds in toothpastes both commercial and homemade, baking soda is a winner that is an effective stain remover that causes minimal abrasion to teeth. It has the ability to neutralize the acids produced by cavity causing bacteria without irritating sensitive gums. Bentonite clay has a mineral hardness index that makes it even more kind to teeth and sensitive roots than baking soda. It might be too soft to remove the pellicle but would make a fine polish for teeth. Diatomateous earth is plankton bodies harvested from under sea deposits. They have a silica skeleton that is as abrasive as fine sand. Too abrasive for teeth to be used on a daily basis in homemade toothpastes. Activated charcoal powder has been incorporated into commercial toothpastes and users swear by it. Is it safe to use? Yes. It’s safe, other than the temporary black color your mouth takes on after use. I’ve had powdered activated charcoal used in the emergency room on my daughter after she ingested a toxic material. Could it stain the edges of fillings or get wedged in small defects in teeth? I expect it could, so buyer beware. It comes as powdered activated bamboo charcoal, if you want to experiment with it as you make your own toothpaste. If you are willing to use peroxides, the strips are worth considering as they minimize swallowing excess solution. If you want to refrain from using peroxide the best stain removers will be baking soda, bentonite clay and powdered calcium carbonate in your homemade toothpaste. In the first part of this article, we looked at teeth whitening products available in the dental office. In the second part of this article we looked at the retail products available for purchase in brick and mortar stores and online stores. And in the third part of this article we looked at the do-it-for-your-self, home-made products. No matter where you elect to purchase teeth whitening products there are risks you need to consider. In a professional office, the most significant risks will be explained to you. If you seek products form other locations, I recommend you consult with your holistic dentist to protect sn incredibly valuable asset, your teeth. The teeth that make up your smile are not easily replaced so take good care of them well and choose wisely.